Tired of missing out on ICOs? Subscribe for alerts now. – Ethereum based freelancing platform. – $0.25 = 1 CL; Nov 21–30 = 5% CL bonus. – ICO is live and ends on December 15, 2017. – 273,000,000 total CL available out of 300,000,000 total CL token supply. – Soft cap of $10,000,000 has been reached. Coinlancer is an Ethereum based freelancing platform that uses blockchain technology to create a more meritocratic freelancing ecosystem. The protocol design uses a smart contract based Escrow mechanism, creating a platform fair to both clients and freelancers. 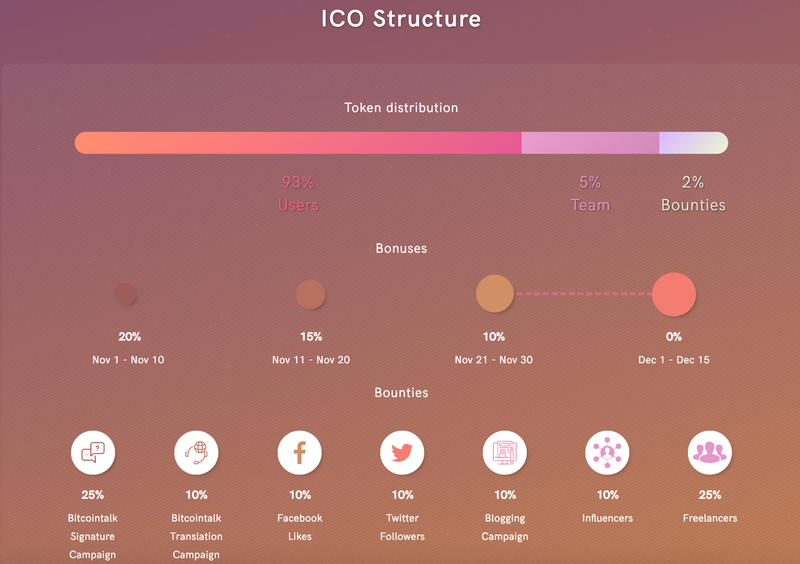 ICO Alert: How does the Coinlancer token (CL) function within the platform and why is it needed? Coinlancer: Coinlancer is the native token of Coinlancer platform. This token is the primary mechanism by which 3% escrow fees will be paid to the Coinlancer platform. ICO Alert: Can you give us a brief overview of the current freelance market? Is there significant market growth predicted in the upcoming years? Coinlancer: Freelancing is a huge, exponentially growing market in every area of the world. Current statistics show that in the United States alone there are 55 million freelancers, accounting for 35% of the U.S. workforce, which earned about $1.4 trillion in 2016 alone. In the next 10 years, freelancers will represent the majority of the U.S. workforce (>50%). In Asia, there are over 110 million freelancers, around 15 million of which are only Indian freelancers, representing around 24% of the national workforce. ICO Alert: In your whitepaper, you describe demographics as being a contributing factor in exponential growth within the industry. Why is this the case? Coinlancer: Demographics are the main driver behind the exponential growth of the freelance industry. Millennials and the younger generations are less attracted to the idea of a full-time 9–5 job. Instead, we are seeing the movement of “digital nomads” who are powering the gig-economy. This trend is expected to continue, moving proportionally with the projected growth of the freelance industry. ICO Alert: What are some of the issues faced by both freelancers and the companies that contract them? How will Coinlancer solve these issues? ICO Alert: Can you take us through a specific user experience on the Coinlancer platform? Coinlancer: The platform has a friendly and easy-to-use interface for clients and freelancers to help post their requirements with ease. Clients can list their jobs and freelancers can bid for them to get the desired jobs. To ensure the authenticity of the users, the platform will be performing identity verifications whenever necessary. The unique identities of clients and freelancers will be based on their addresses in the blockchain, making it difficult to forge. When a contract is awarded by the client, he needs to deposit platform fee, which is paid in the Coinlancer token. The platform will utilize smart contracts and escrow mechanism to hold the fee and perform disbursement of the collected funds on obligations met. Once a fee is agreed upon by a client and a freelancer, an additional 3% platform fee is deposited by the client in our escrow system. The fee is released on successful completion of the project and 3% is held by the platform.The 3% platform fees will be paid in Coinlancer tokens. ICO Alert: It goes without saying that in order to have a successful ecosystem, you will need both businesses and freelancers to adopt the platform. How are you attracting both to Coinlancer? Coinlancer: Without any doubt, a marketplace business model is hard to get going, as one needs to take care of both supply and demand sides. In our case, those are the employers and the freelancers. We are confident that our value proposition is extremely attractive to both in terms of platform fees, security, flexibility. Having said that, it goes without saying that we are planning on aggressive marketing campaigns in and beyond the crypto community. ICO Alert: What is the Freelancers Tribunal and why is it important to the platform? Coinlancer: Our Ethereum based platform confirms a fair control by means of a Freelancers Tribunal into our system. The tribunal involves freelancers with a high-profile ranking into the settlement of disputes. Every freelancer in the tribunal is entitled to cast a discerning vote that favors the rightful party and the consequences will be executed according to the Freelancers Tribunal. ICO Alert: The Ethereum network has occasionally suffered from slow transaction times. Is there any concern that this may affect the Coinlancer platform? Coinlancer: Not at all. The Ethereum network, although still in an early stage of its development, is extremely stable and sufficiently quick. With Coinlancer running on the Ethereum blockchain, payments on the platform are going to be many times faster than the current market incumbents. ICO Alert: As a non-Coinlancer question, we like to ask for unique predictions for the ICO and crypto currency space in the future. Where do you see both in the next 3–5 years? Coinlancer: We believe that blockchain and cryptocurrencies are still in the very beginning of mass adoption. What does that mean? Initial Coin Offerings are on their way to becoming the norm in early-stage blockchain tech fundraising, rather than being something hyped, and often frowned upon. Same goes for cryptocurrencies when it comes to payments and transactions. Blockchain is indeed a revolution and the benefits of the technology are enormous when we consider its day-to-day adoption. The ICO for Coinlancer tokens (CL) is live and will end on December 15, 2017. Accepted currencies include BTC, ETH, LTC, fiat, and many more. The soft cap of $10,000,000 has been reached and there is a hard cap of $50,000,000 set for this period. Visit the Coinlancer website for more information and the contribution address. There will be a maximum supply of 300,000,000 CL tokens created, with 273,000,000 (93%) available during main ICO period. CL tokens will be distributed by December 31, 2017. The whitepaper is available for additional details regarding distribution. Ian has worked in the marketing domain for several years. Most of his tenure is comprised of freelancing in various forms of marketing, including performance marketing and affiliate marketing and advertising on platforms such as Google, Facebook, Twitter, and Mediabuys. Charles has been a coder/hacker/maker for over 16 years. He is zealous about technology and business. Charles has launched three ventures with successful exits over the past decade, with his primary focus on Blockchain/DLT tech and consulting. Rushabh is currently the CFO at Coinlancer. He has previously held the positions of finance director at Plus Group and analytical manager at Crisil Ltd.
Dhaval has previous experiences as VP of strategy with a demonstrated history of working in the financial services industry. He is skilled in trading, risk management, derivatives, business strategy, and commodity markets. Dhaval also has strong business development professional expertise, and holds an MBA from Mumbai University.